It’s funny – I just realized a recent happening in the world of brands that has, in a queer way, connected my previous 2 blog posts. Speaking about Apple and Minimalism, I have posted designer Wonchan Lee’s much acclaimed minimalistic posters that are inspired from Pixar’s famous characters. You would see that in each of these posters, Wonchan Lee has sought to, and incredibly succeeded at, bringing out the personality of each character by using almost only the eyes, and leaves no doubt about who these characters are (to someone who is familiar with these movies – Up, Wall-E, The Incredibles, Monsters Inc, Monsters Inc (Sully), Toy Story, Ratatouille and Finding Nemo – in that order). 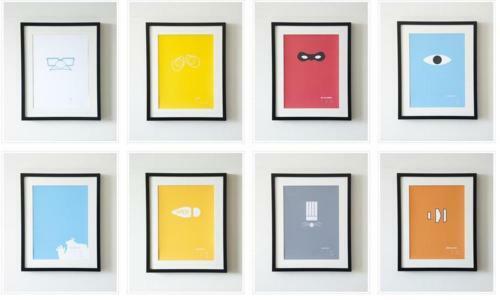 His website says that each of these posters come in Synthetic Matt finish and an A3 size comes for 25$. Given the pull factor that these minimalist posters could have, as they challenge the viewer and plays with his/her imagination, I am sure these would have many takers – potentially also spawning fakes! Cut to my previous post on brands that use the inherent limitations/constraints of their ‘system’ to create a commonly identifiable set of shared experiences among the user base and thereby make ‘tribes’ of them. 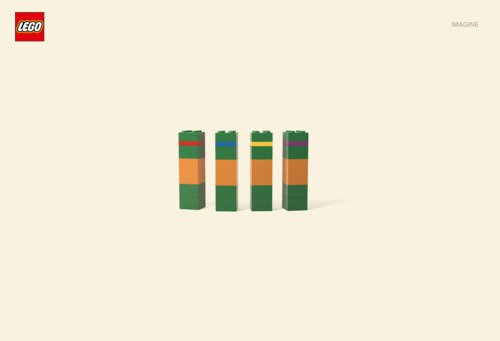 One of the examples that I wrote about was Lego – a brand that was literally built by its famous and consistent ‘Lego bricks’. My argument was, given that each of these bricks are functionally similar to each other (for over decades! ), they come with very similar set of capabilities and constraints for any given user across the world. Thereby any interesting possibility that can be realized out of these bricks tends to be limited only by the user’s imagination and subsequently spurs the other members of the tribe as an inspiration or a challenge. 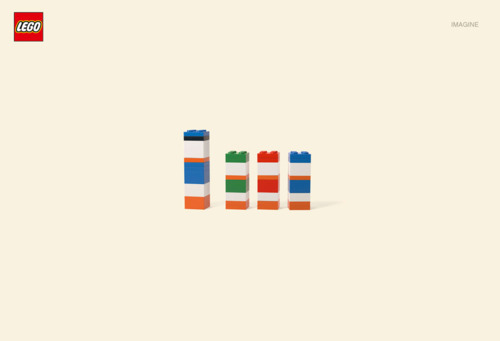 If you stop for a moment and reflect upon these dynamics, it would be evident that Lego is also speaking (in a focussed way) to an adult (as a potential consumer), an adult who loves to exercise his creative/exploratory capabilities to his/her ‘playful fullness’; an adult who is imaginative and yes fun loving. 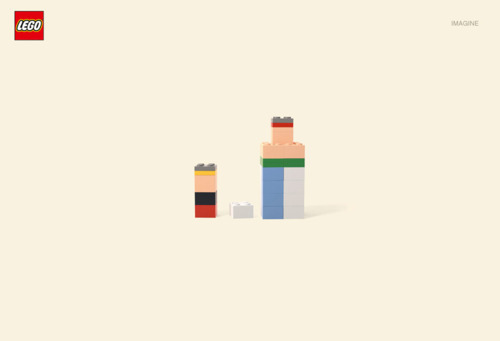 Probably it is along these lines that Lego has commissioned the following line of Print Ads with the help of an agency named Jung von Matt. 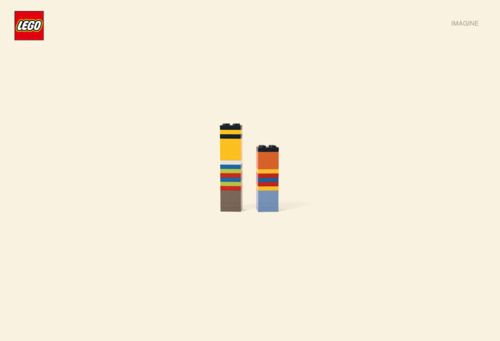 Essentially, these are minimalistic interpretations of popular cartoon-characters. Can you guess who’s who? I loved their simplicity and the power of imagination that is evoked by these executions. Squarely hits at the bulls eye of their ‘adults’ target group and seeks an undivided quantum of their attention by means of this ‘Guess-Who’ kind of dialogue/challenge that they are playfully throwing at them. Being, not super comic-savvy, I set out to Google around and tried to build parallels with the actual cartoon characters referenced in these executions. Following is what I could knit together as an exercise for myself. 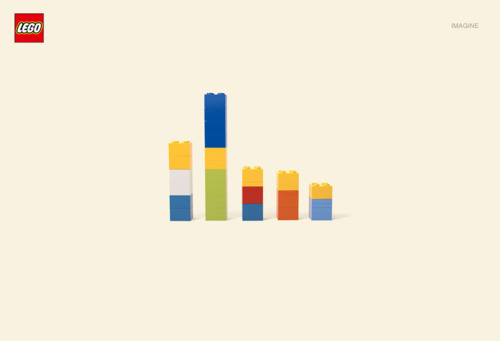 (Cartoon referenced: The Simpsons) – this is my 2nd favourite! (Cartoon referenced: Teenage Mutant Ninja Turtles) – this is my 1st favourite! I should say that I am very inspired by this upcoming trend in brand communications that seeks to engage the consumer, grab an undivided pie of their attention (even if it is for a sliver of a moment) and evoke their imagination so that they discover something by themselves and thereby are entertained. That is the power of imagination. Unleashed. 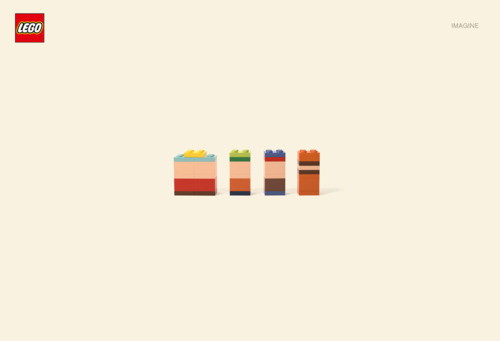 This entry was posted in Uncategorized and tagged Apple, Cartoon, Imagination, Lego, Minimalism, Pixar. Bookmark the permalink.